In my last few articles, I talked about how you can plan a trip to Gangotri; including details on how to reach, best time to visit, places to see and things to do. Continuing in the same series, in this post, I will provide a detailed description of Gaumukh Trek which is one of the biggest tourist attractions of Gangotri. In fact, it is this 18 kilometers long trail to Gaumukh that attracts 90% of the tourists here. There are majorly two kinds of people that visit Gangotri; either the devotees or the adventure enthusiasts; and for both of them, walking to Gaumukh and tracing River Ganges back to its origin is one of the biggest attraction of a trip to Gangotri. For a brief introduction, Gaumukh, also known as “Gomukh” or “Gomukhi” is the source of the Bhagirathi River. It is the point where Bhagirathi originates out of Gangotri glacier (picture below) and then flows downhill to be later called River Ganga. It is situated about 18 kilometers from Gangotri and at an altitude of 13,200 ft (4,023 meters). The motorable road ends at Gangotri and the final distance to Gaumukh can only be covered by foot. Due to its religious importance, it is a popular Hindu pilgrimage site; and due to the trek being neither too difficult nor too easy, it is also a much sought after trekking destination. 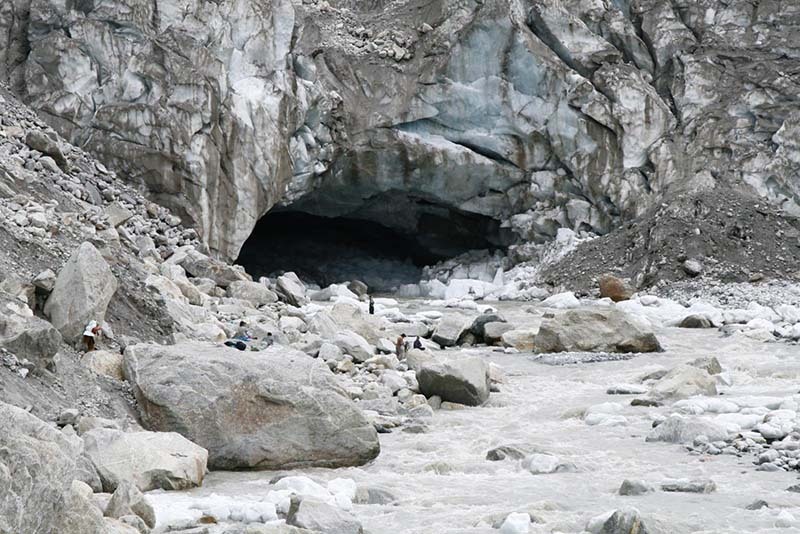 The word “Gomukh/Gaumukh” literally means “Mouth of a Cow.” It is said that the snout of Gangotri glacier where Bhagirathi comes out from looked exactly like the “Mouth of a Cow” in old times and hence the name. Please note that this article only covers the part about trekking to Gaumukh after you have arrived in Gangotri. The information below will tell you how you can plan your trek, what permits are needed and, some of the things you should keep in mind. If you, however, would also like to know the details on how to reach Gangotri then please read the previous part of this post, Gangotri Travel Guide. Best time to trek Gaumukh would be from Mid April to June and then again from September to early November. Gangotri remains closed from late November to March so a visit in these months is not possible at all. The risk of rain would make the trek and journey tough to execute in July and August. This is also the time when it gets a little crowded in Gangotri with ongoing Kanwar Yatra. Hence it only leaves the months of spring (April), summer (May and June) and autumn (October) to trek to Gaumukh. A permit is required for a person to be able to trek to Gaumukh. This permit can be obtained from either District Forest Officer in Uttarkashi or at the forest office in Gangotri. There is a daily limit of 150 permits per day and it is issued on first come first served basis. The first place to get the permit would be at DM office Uttarkashi. You will anyways cross Uttarkashi while going towards Gangotri so you can actually get the permit while on the way. The DFO office is located at the northern end of the road just ahead of the bus stand. It is a government office open on all working days during normal working hours. Getting a permit from here is quite simple really. You just fill out your name and address on a form; attached your government issued Identity proofs like Aadhar Card, PAN Card or Voter’s ID; and a pay a fee of Rs. 150 per person. If you did not get the permit at Uttarkashi for some reason, you can obtain it in Gangotri as well. It is issued at the forest office which is located just as you enter Gangotri to your left. Charges and procedure will remain the same but the problem is that this office is only open from 8.00 am to 10.00 am; and then 5 pm to 7 pm. On a brighter side, this office remains open on all days including Sundays as well which the office in Uttarkashi is not. Cost of the permit is Rs. 150 per person for Indian citizens and Rs. 600 per person for foreign nationals. The permit for Gaumukh is valid only for 2 days. So, for example, if you started from Gangotri on Monday, you must return by Tuesday evening. The duration is extended if you plan to trek to Tapovan as well. Thankfully, permits for Gaumukh trek can be obtained online. You will need to visit the official page for Online application for Gangotri National Park permission and fill in your details. You will also be asked to upload required Identity proofs on this page. After you submit the application, you will receive an email confirming that your permit was approved, provided that you are able to produce original documents at the office. Take a printout of this email and show it at either the DFO office in Uttarkashi or at the forest office in Gangotri along with your original documents to collect your permit. Payment for the permits can either be made while you were submitting the online application, or you can pay in cash when you show the permit later at either in Uttarkashi or Gangotri. The DFO office in Uttarkashi remains closed on Saturday and Sunday so please plan your journey accordingly. On the online application form, it will ask you to select a Tour Operator towards the bottom of the page but that is not a mandatory field. If you are visiting between May to November, then you can leave this field blank. If you were, however, visiting in April before the temple doors were open, then you would have to select a local tour operator on this page. Now that you have obtained the permit, let me provide a brief summary of how your trek is going to look like. There are four major points on the route; Gangotri, Chirbasa, Bhojbasa, and Gaumukh. The route will look something like this. The difficulty level of the trek can be called moderate but it does get a bit challenging and steep at some points. The stretch between Gangotri to Chirbasa is a little easy but the challenging nature of the trek starts to come more into the picture as you proceed further. Gangotri really is a small town and finding the starting point of Gaumukh trek won’t be a difficult task. Ask any of the locals and anyone can point you in the right direction. But as a reference, the trek begins from around 100 meters behind the Gangotri temple. One has to climb a steep stairways in order to reach the starting point of the trek. The first couple of kilometers is really an easy walk and you will arrive at the check post. Entry to trekkers and visitors is only allowed after 6 AM so my advice would be to start as early as possible from Gangotri. If you started by 5 in the morning, you will be at the check post by 6 and can be on your way to Gaumukh as soon as the entry opens. At the check post before the start of the trek, you will be asked to show your permits as well as all the plastic bags that you were carrying. All your chips packets, chocolate covers, Biscuit packets, polythene bags will be counted and you will be asked to deposit a certain amount. When you return, this fee will be refunded only if the count of plastic covers that you are carrying matched the one from the morning; meaning that you brought all the plastic covers back and did not leave anything behind. If the count did not match, this amount will be forfeited. You will be required to produce your permits at the checkpoint, as well as the original Identity proofs. You will make the payment if you did not already do so while procuring the permits online or at Uttarkashi. Your bags will then be checked for how many plastic items you were carrying and all of it will be counted. You will then make a deposit against your plastic items and will then be allowed to enter. The entire trail is to Gaumukh is well marked and you will have no trouble navigating your way. It will continue to gradually increase its gradient but will not be too challenging to handle. The name Chirbasa literally means “the abode of Pine trees” and it is named such because there are a lot of pine trees around here. In fact, you will be able to recognize the place by the huge cluster of pine trees. It is located at a distance of 9 kilometers from Gangotri and for this entire length; you will pretty much be on your own. There will not be any Dhabas, shops, tea-stalls or anything of that sort in between. Hence it is extremely important that you bring something to munch on along the trek. Also ensure that you are carrying a water bottle that you can fill in from any of the water streams en route. Trekking from Gangotri to Chirbasa will take you about 4 to 5 hours. If you were at the check post by 6 and started as soon as the entry was allowed, you should be able to reach Chirbasa before 10 AM. There is a small Dhaba here where you can take a short break and restock your energy levels. Chirbasa is known to be the last place where you will see some vegetation on the trek. After this point, trees mostly just vanish and the landscape seems to look like a barren wasteland. The next stop on the trail will be Bhojbasa and until then, you will again be on your own. There will not be any dhabas or tea stalls anymore so do not forget to fill your water bottle and get something to eat on the way if you weren’t carrying anything. Bhojbasa is located at a distance of about 5 kilometers from Chirbasa and it will easily take you 2 to 3 hours to complete. The ascent in the trail will be quite the same as between Gangotri and Chirbasa and it will be an easy to moderate walk. The vegetation too will continue to get lesser by each passing kilometer as you get closer to Gangotri Glacier. Located at an altitude of 3800meters (12,450 feet), Bhojbasa serves as a stopover for people trekking to Gangotri or even further to Tapovan. It is really not much except for a huge ground like area in the middle of nowhere and a couple of buildings in it. By now, you would already have walked 14 kilometers since you started from Gangotri in the morning. Accommodation at Bhojbasa is available in form of Ashrams and a GMVN guest house; and both are very basic, dormitory type accommodation. After you reach Bhojbasa, you have two options. You can either break the journey for the day and trek to Gaumukh the next morning. Or you can continue all the way to Gaumukh, come back and stay at Bhojbasa for the night and return to Gangotri the next day. Since the duration of Gaumukh permit is only two days, you will have to return to Gangotri the next day anyway. My recommendation is that you do not go to Gaumukh on the very first day and do it the next morning. The reason behind this is that Gaumukh is another 4 kilometers from Bhojbasa and this is where the trek becomes challenging as well. If you continued to Gaumukh, you will be in a hurry to reach and come back to Bhojbasa before dark. This will also not give you any time to spend at the glacier. Hence it would be better to stay at Bhojbasa for the night and start trekking to the glacier the next morning. If you were carrying your own camping gear, then Bhojbasa is the place where you will pitch your tent for the night. Camping is not allowed by law anywhere after Bhojbasa. The trek will get a bit challenging after Bhojbasa. It will be steep and there will be boulders as well on the way that you will have to jump over. The trail starts from behind the GMVN rest house but ask anyone here if you weren’t able to spot it. The path however will still remain well marked; and easy to spot and navigate. Make sure that you are filling your water bottle in the morning before you start and also are bringing in items to munch on. Finding drinkable water after Bhojbasa will be a tough task so bringing water along will be of utmost importance. Up until now, Bhagirathi would have stayed on your right all along the trek. About a kilometer after Bhojbasa, you will get your clear view of Shivling peak, Bhagirathi group of peaks and Gangotri Glacier. Take a moment, relax and savor on the view while relaxing. The trek after this point will continue to get even more challenging with numerous boulders on the trek so please walk very carefully. One wrong step here can leave you with a twisted ankle or even tumbling down into the river. The trail on the other side of the river however is much easier but it would mean that you would have to cross the water stream. If you find a spot where you can, jump on the other side of the river (river would then be on your left after crossing). Make sure you do not get your shoes wet in the process because that will become a huge problem. Trekking in such cold weather with wet shoes will not be a pleasant experience. After a grueling final 4 kilometers of a trek, you will finally arrive at Gangotri Glacier and Gaumukh. From Bhojbasa, it will easily take about 3 hours to get here. Spend some time, take pictures and then head back to Bhojbasa for the night if you trekked all the way to the glacier on Day 1 itself. If you came here on Day 2 after night stay at Bhojbasa, then it is time for you to head back to Gangotri. There is no mobile connectivity at all at Gaumukh. Airtel and BSNL will work fine in Gangotri but the signals will be all gone about a kilometer into the trek. The only accommodation on the trail is available at Bhojbasa and nowhere else. Depending on our own preference, you can either stay at the Ashram or GMVN rest house. These are both dormitory type accommodation. Hot water will be provided and only vegetarian food is served here. If you want to, you can even book the GMVN Guest house by calling 0135-2740896, 2749308, 2748478; or by emailing at gmvn@gmvnl.com or gmvn@sancharnet.in. You can also book it online at the GMVN Website. Just create a user ID on this site and book your stay. The two Ashrams at Bhojbasa are known as Ram Baba Ashram and Lal Baba Ashram. The Ashram here will charge you Rs. 300 per person and the GMVN Guest House will charge Rs. 350 per person. If you start to feel symptom of altitude sickness anywhere on the trek, please do not climb up and further and return to Gangotri immediately. For example, if you start to feel feverish, have headache, nausea, chest pain, having difficulty breathing, then it means you are suffering from AMS and any further gain in altitude will only make things worse. Stop and climb down immediately. Mentioned below are a few other tips that can be of help while trekking to Gangotri. Any sport shoe will be fine for completing this trek but if possible, do bring a pair of trekking shoes with good grip and ankle length. You must bring a light jacket even if you were trekking in the months of May and June. Wind out here is a bit cold and weather can change unpredictably. Permits for Gomukh can be procured via Fax as well. After 3 kilometers from Chirbasa, you will come across “Gila Pahar”, a place well known to be dangerous because of landslides. You will also come across Bharals, a type of mountain antelope while trekking to Gangotri. The route after Bhojbasa can be a little difficult for some people, and even more so after the 2013 floods. You should avoid trekking in monsoon season. Rains can make the route slippery and this region is prone to landslides, cloudbursts, and roadblocks. Please do not attempt the trek alone. Be in a group of at least two people. Also inform, your folks before you start on the trek. Please carry ample dry fruits, chocolates, snacks and drinking water. Do not attempt trekking at night. Before undertaking the trek, it would be better to consult your doctor. You should carry basic medications (for fever, headache, upset stomach, body-ache) and a first-aid kit during the trek. Please be a sensible tourist and do not litter. If you brought polythene bags along, please ensure that you are bringing those back and not throwing carelessly. Comfortable clothes. You do not want to go trekking in tight fitting jeans. Average temperature at Gomukh and on the trek remains around 15°C to 16°C during summer; and around 5°C to 6°C during the months of September, October and November. It snows heavily in December, January and March here with temperature way below zero degrees making the area inaccessible. Gaumukh is located at an altitude of 13,200 ft.
Total distance between Gangotri to Gaumukh is a 18 kilometers. Difficulty level of Gaumukh trek is moderate to difficult. Starting from Delhi, you can follow the following itinerary for a trip to Gangotri and Gaumukh. I am assuming Delhi as the starting point here but even if you were coming from a different city, only the journey to and from Delhi will be different. The trek details from Gangotri will still remain applicable. If you had some more time in hand, then you can extend your trek further to Tapovan. Please note though that for Tapovan, you will need to hire a local guide and arrange for your permits accordingly. Tapovan trek cannot and must not be attempted on your own without proper guidance. That pretty much is all that you need to know about trekking making a trip to Gangotri and then trekking to Gaumukh. I hope the information above was of help. If you have any questions; or need any other details; please feel free to ask in the comments section below; or at our Community Forum; and I will be glad to answer.